I love 80’s movies or at least some of them. My two favorites though are The Breakfast Club and Last American Virgin. Now wouldn’t it be cool if those were re-released? That’s what they’re doing now with War Games. 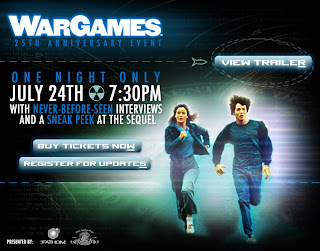 It’s been 25 years since the release of War Games and now for one night only they’re releasing it in select theaters nationwide. Now you can see it all over again and they’re also showing never before seen footage and letting you have a sneak peak at the sequel. Now how cool is that? If you have kids, you can take them to see this classic or just go see it yourself. Now, let’s hope they reconsider The Breakfast Club.